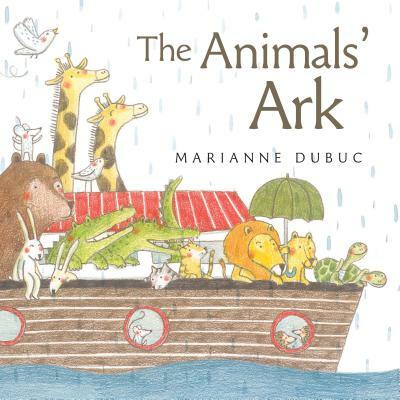 In this delightful picture book, award-winning author and illustrator Marianne Dubuc retells the biblical story of the ark voyage from the animals' perspective. It begins with a light rain in the animal kingdom that turns heavier and steadier until all the land is flooded. The animals are huddled together atop a hill, the only dry spot left, when they spy a boat coming toward them. Rescue! The smiling captain, Mr. Noah, invites them to board, two by two. At first, the animals enjoy settling in and finding ways to amuse themselves --- the sheep play leapfrog, the ladybugs play dominoes, a chameleon plays hide-and-seek. But as it continues to rain, and rain, and rain, things grow testy below deck. The animals are getting on one another's nerves. And all of them are wondering, will the rain ever stop? With sweet, warm illustrations, this is a creative and child-friendly version of the well-known journey story. The playful animal drawings are filled with details and sly jokes, making them great fun for children to spend time with. This book makes a wonderful read-aloud, either for its connection to the biblical tale or merely as a lighthearted animal story. With the focus on how the different species fare individually and together, it would also work as an exploration of animals and their unique behaviors. It could easily spark discussions about how children might use cooperation, respect and kindness in trying circumstances as well.